This mirror work yoke was done in 2012. The idea was to have a filing pattern made of mirrors. I had small and big square mirrors which were ideal for drawing the pattern on 2mm graph paper. 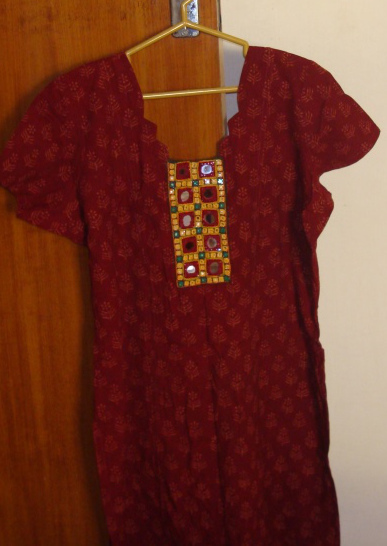 The tunic was deep red with block printed yellow motifs. Deep red fabric was chosen to work mirrors. 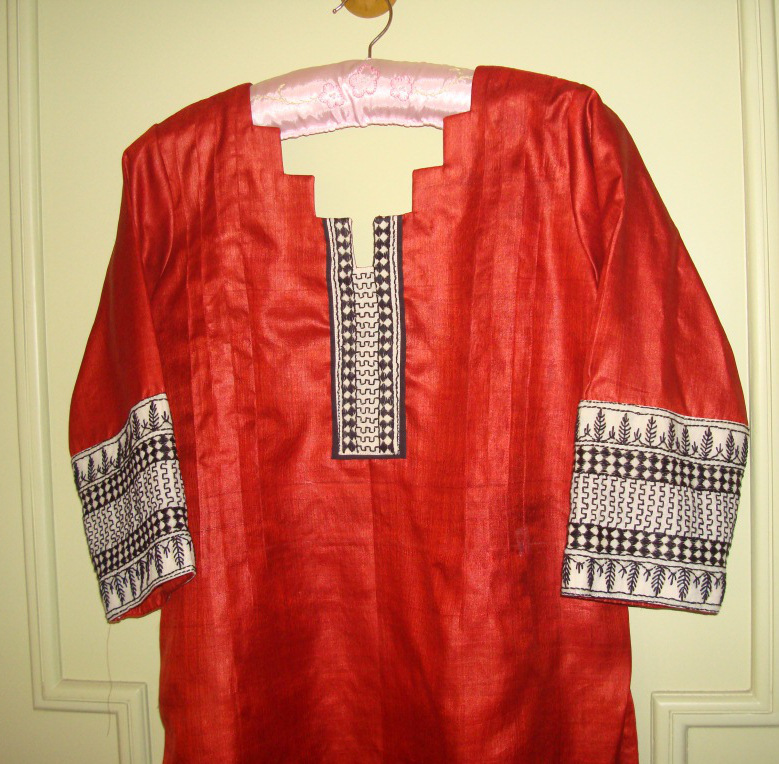 Two colours were based on the tunic- deep red and yellow. Green colour was also added to give it and full Indian ethnic look. The outlines were done in chain stitch. The detail. when I counted the number of mirrors on the pattern,it came to 100, so the name stuck. 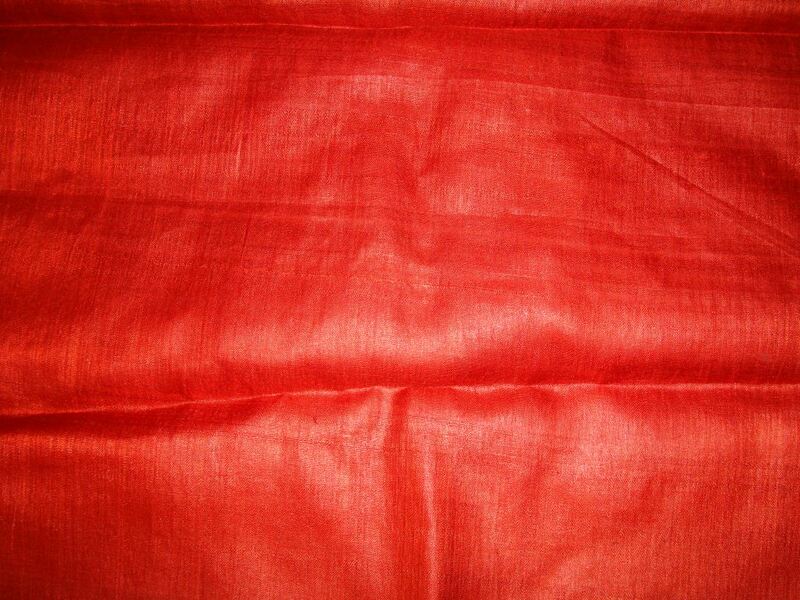 Many days this salwar fabric was lying on my closet without any design ideas. 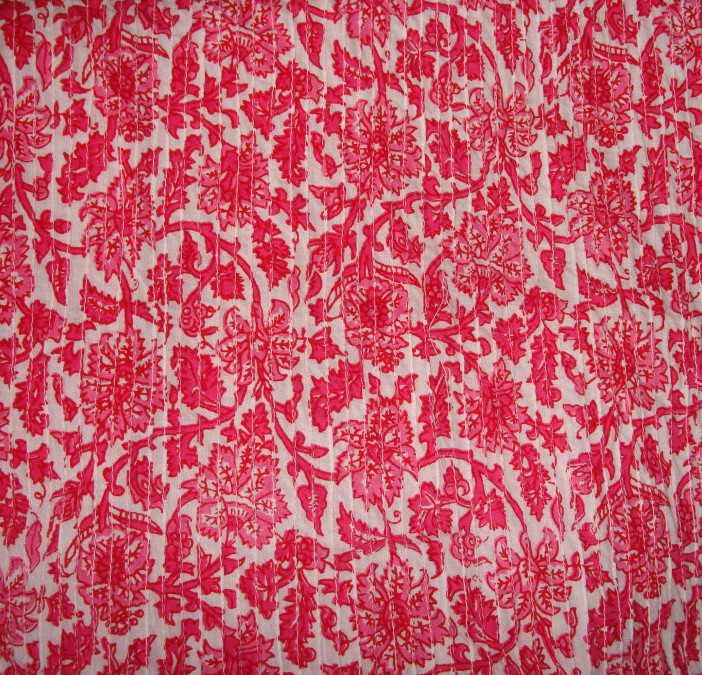 This fabric is kalamkari block printed cotton. 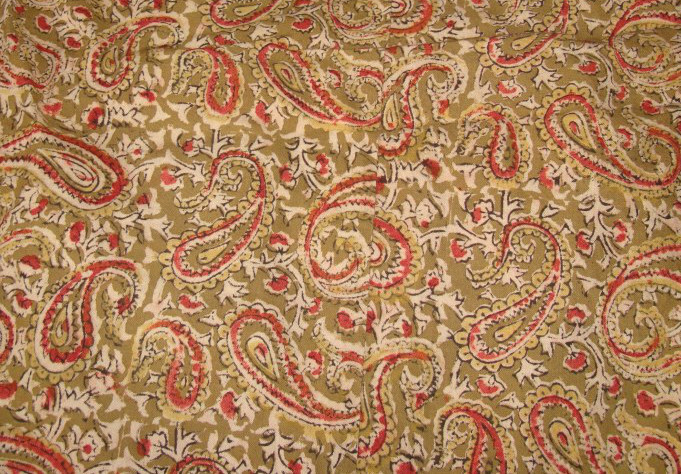 A plain peach mercerized cotton fabric matched with the paisley outlines. 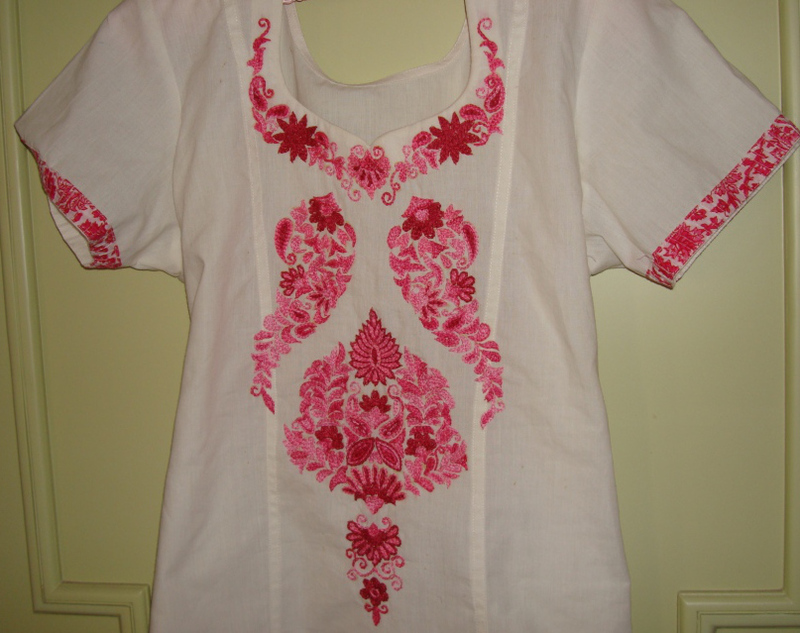 A plain tunic gives opportunity for embroidery. 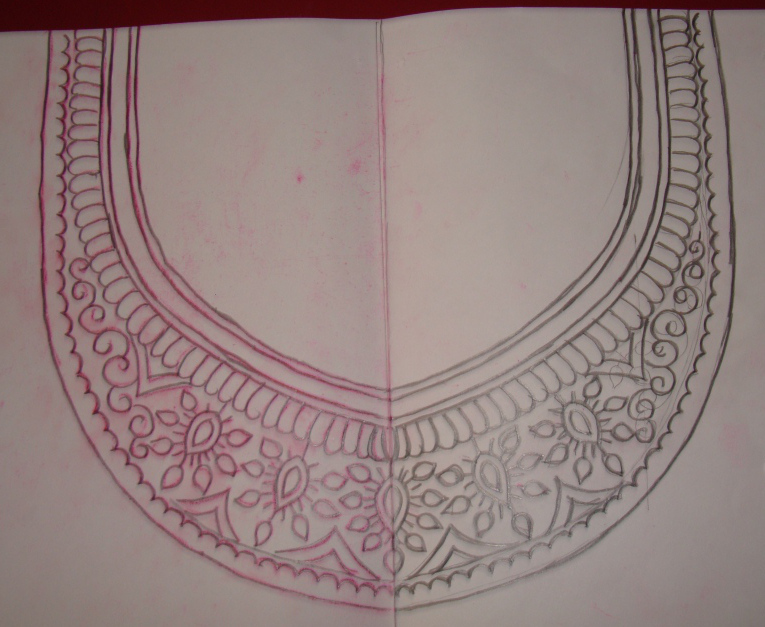 A simple embroidery pattern for the front of the tunic with an idea of herringbone filling was drawn. 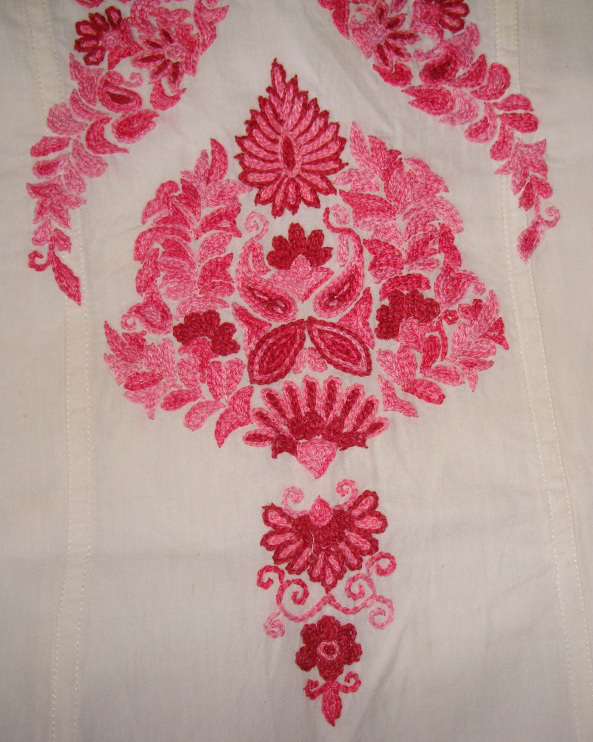 The embroidery was worked with cotton skeins. Maroon and shades of green thread were used for herringbone filling stitches. 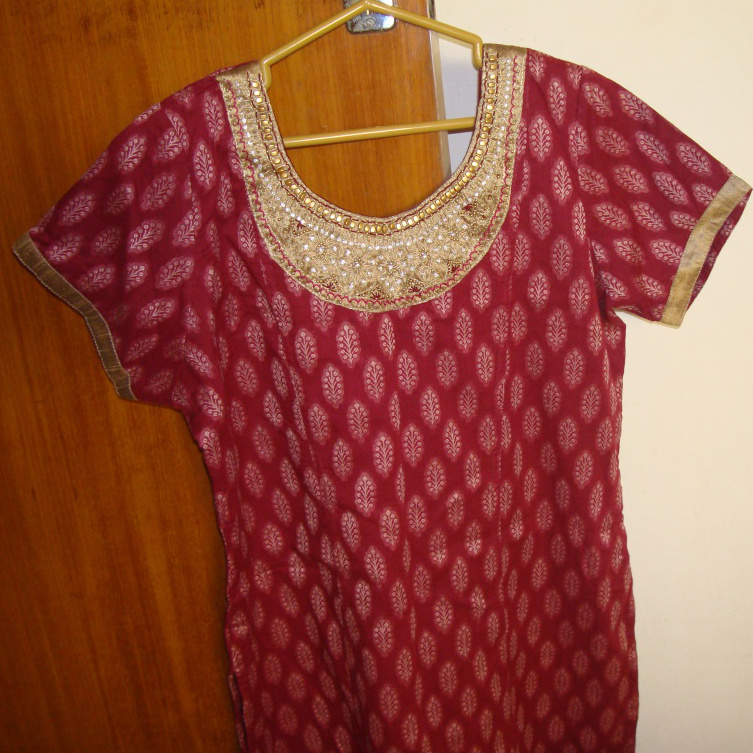 The outlines were done in beige thread [salwar fabric colour] in back stitch. 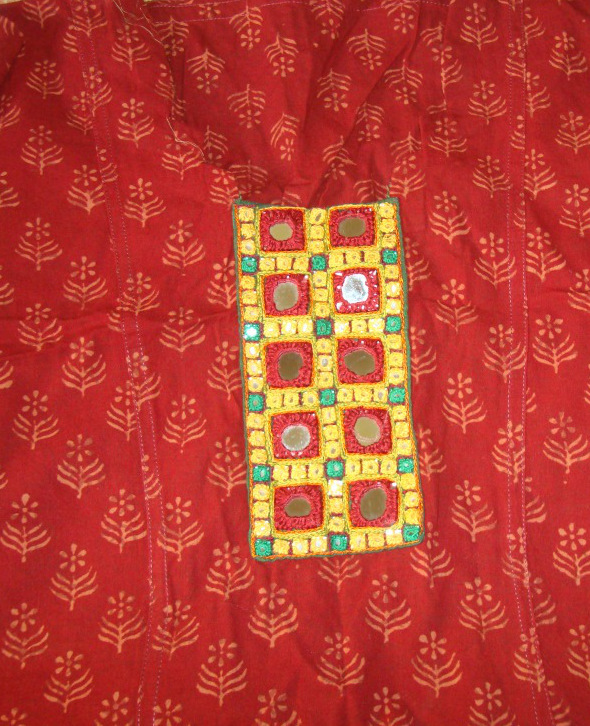 Small wooden beads were used for embellishing the inner border. 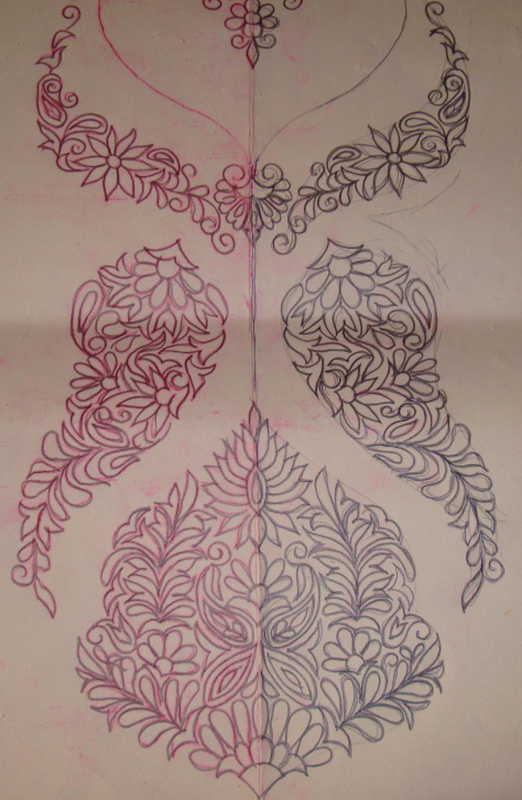 The idea of this pattern was to fill up traditional Indian motif patterns with Kashmiri embroidery. 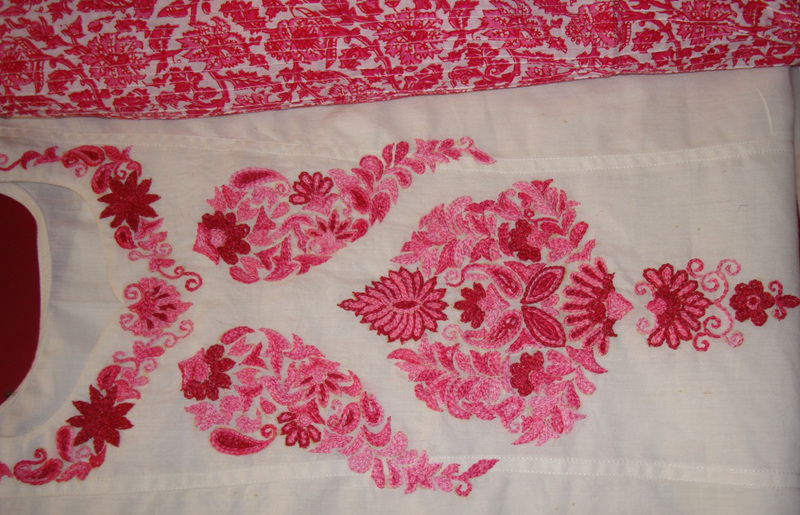 There are three types of Kashmiri embroidery. This type is chain stitch filling. I wanted isolated symmetrical motifs to form this front panel. The pattern in two parts. 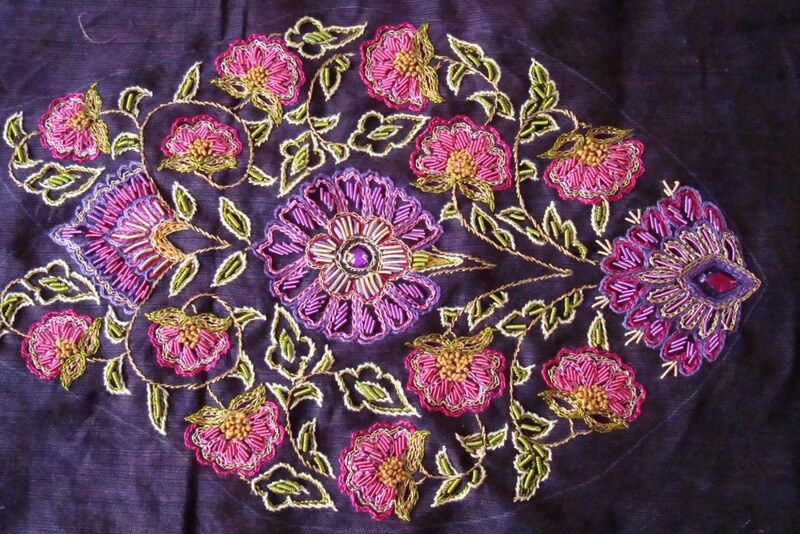 The embroidery as mentioned earlier was chain stitch filling. The darkest pink was the first colour to be used. 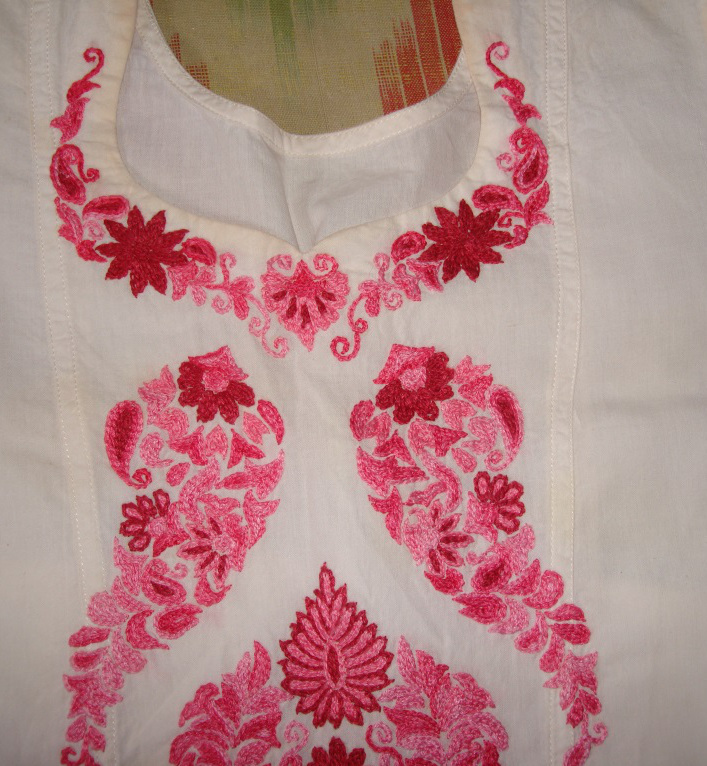 The embroidery detail around the neck. The rest of the embroidery details. 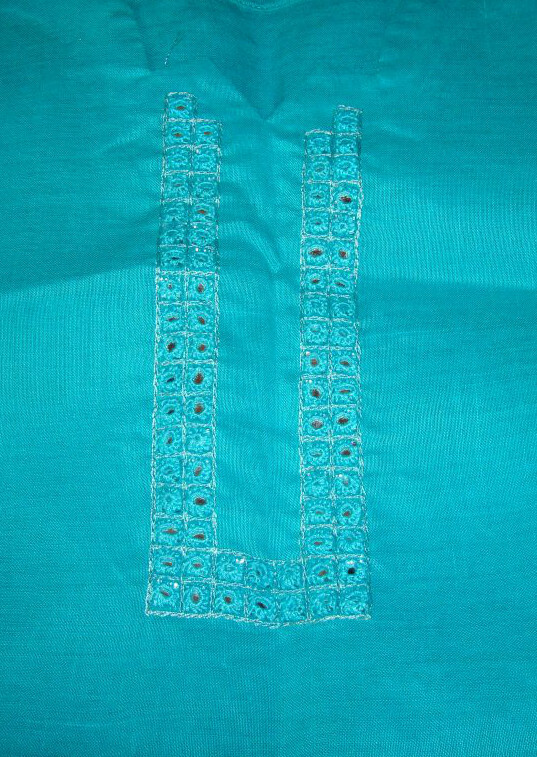 The sleeves are bordered with salwar fabric. I like this idea for two reasons, the embroidery filling and the space between the embroidery, which shows the white fabric. 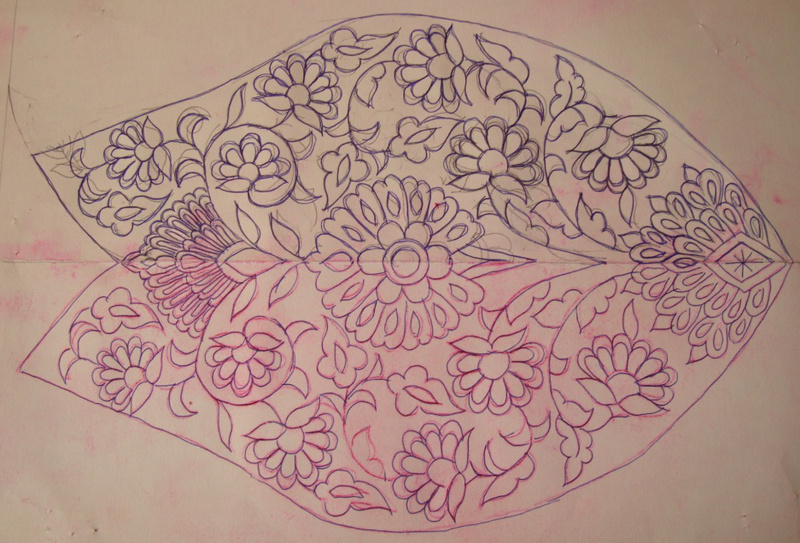 it was not easy to draw this pattern, still it was worth the time and effort put into it. 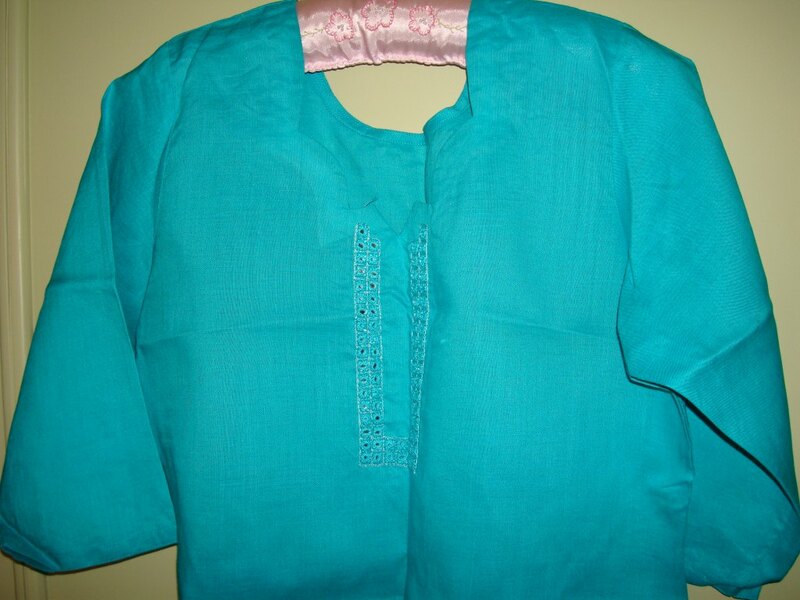 I had this lovely plain blue linen tunic. Though the colour and the fabric was good, it was too plain. I wanted an embroidery which will not subdue the blue. I had heard that, when mirrors are worked with lighter tint of the base colour, it adds elegance to the piece. Merging these two ideas, a pattern for using small square mirrors was drawn on graph paper [76 mirrors]. The mirror fitted exactly within 1 cm square. The outlines were worked in light blue silk thread, and the mirrors were stitched in cotton skeins.the embroidery details. I recently bought a printed white salwar with blue[same blue] and light green florals. The tunic and the salwar match well. 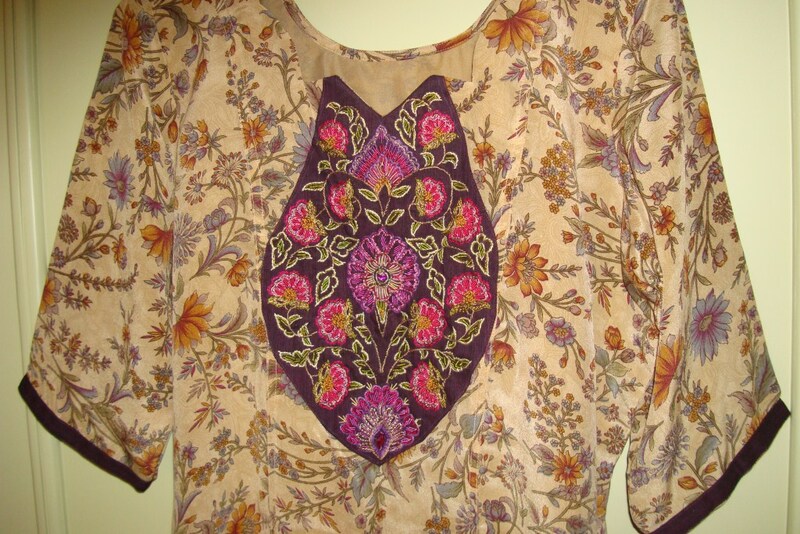 I did not post the details of some of these tunics when they were worked. 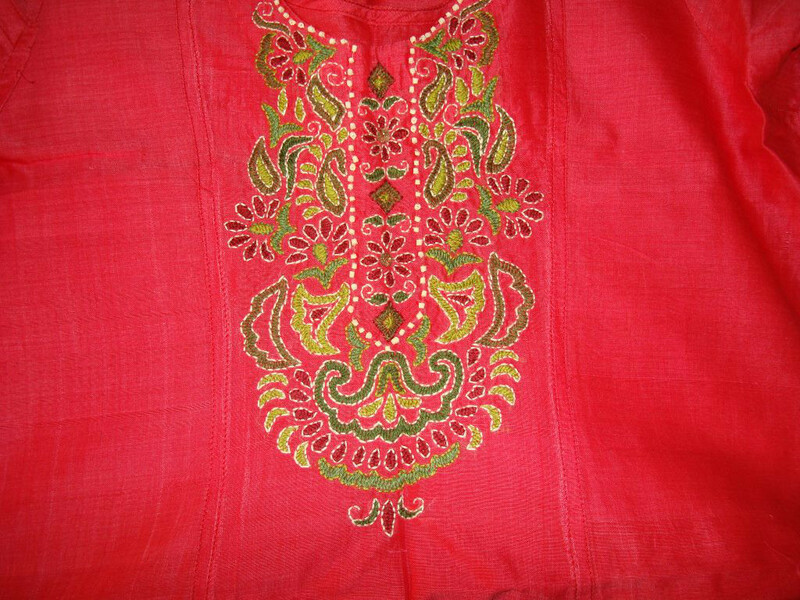 The details of the work when it was in progress are not available for these tunics. I am sharing the pattern and the completed tunics. I saw a plain tunic with broad woven border. The border was in cream or half white and woven in black. The shop said it was a Bagh border which was attached to the tunic. 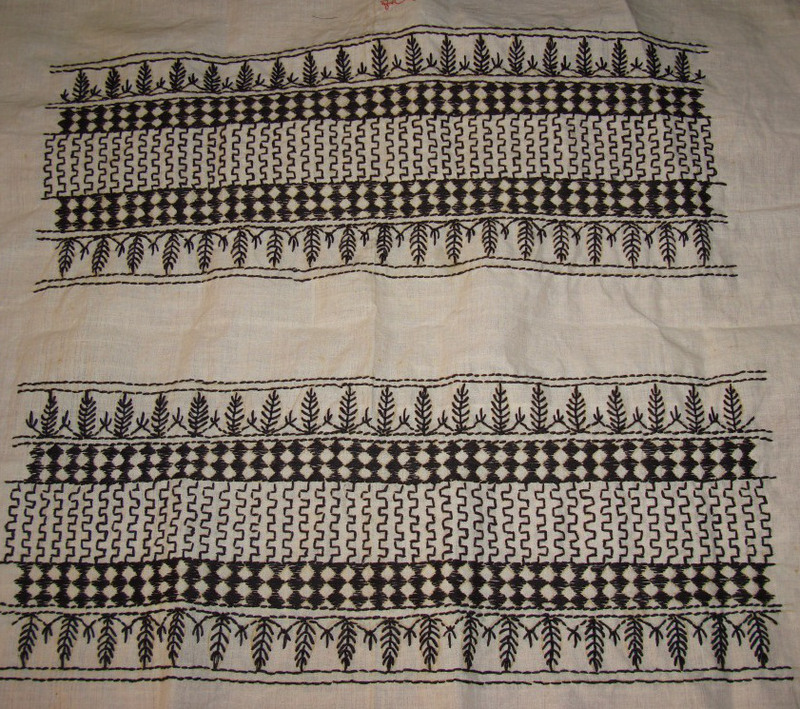 They had also done some kantha embroidery in black on the border. 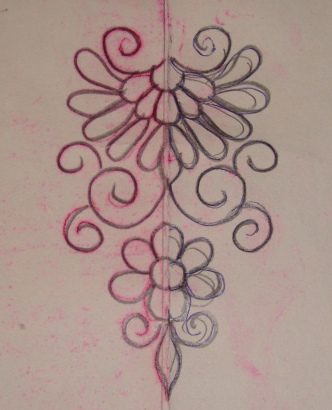 This inspired me to design a border with geometric patterns which can be worked with kantha embroidery. Thought a plain tussar fabric would be ideal for this. The sleeve pattern, it is really broad! I wanted a black border around the yoke. 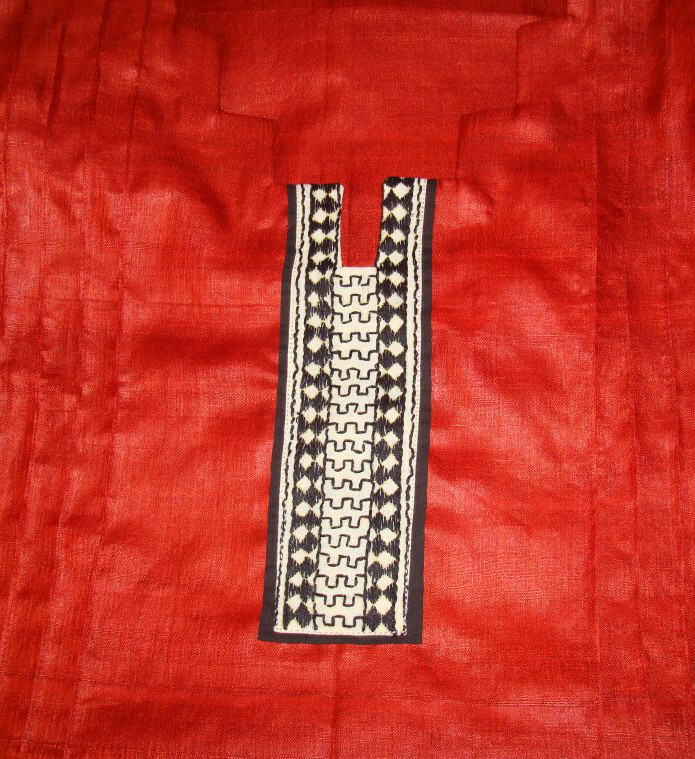 The embroidered yoke along with black fabric placed on tunic fabric. 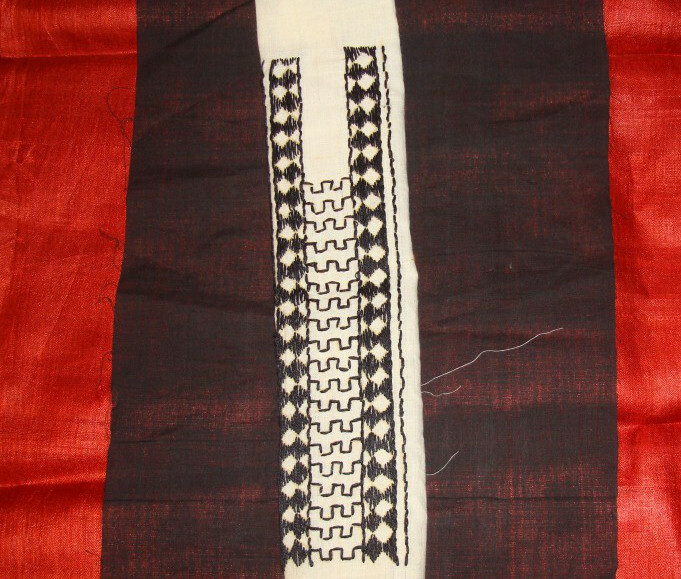 The embroidery was done in black cotton skeins. 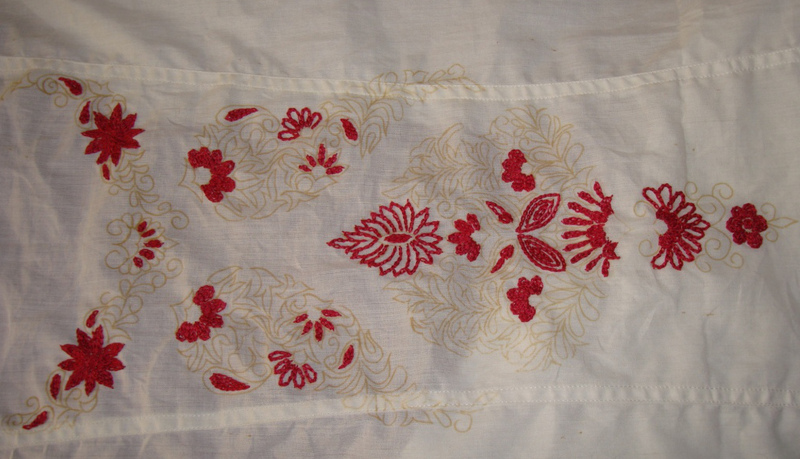 I used the running stitch on the kantha embroidery to obtain the woven effect. For the fly stitches on both ends of the borders I used four strands and rest of the embroidery was done with two strands. 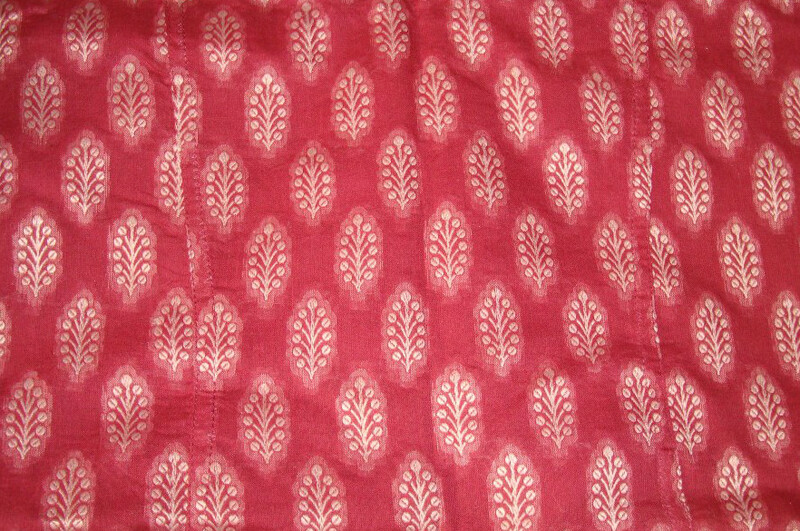 This tunic fabric is printed chanderi silk cotton in maroon colour. 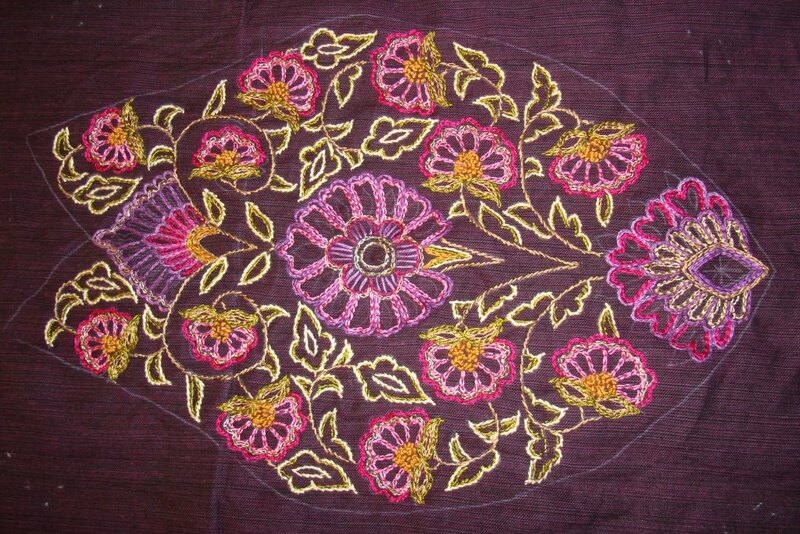 I wanted to work zardosi embroidery with stones on a golden colour fabric. This tunic was ideal for my design. 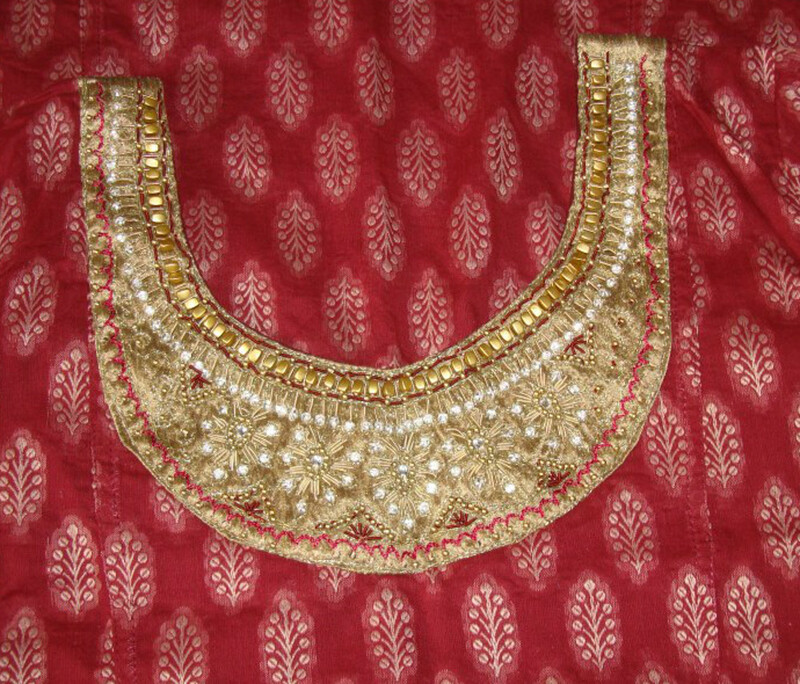 A neckline based on traditional Indian design with scope for zardosi beads, stones and novelty beads was drawn on paper. 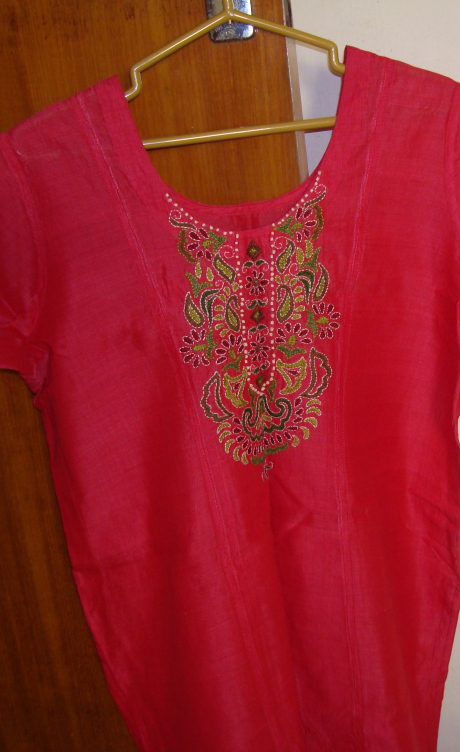 I wear a maroon salwar and dupatta for this tunic. This tunic actually does not need any value addition at all. Still I enjoyed embroidering this piece, I like the subdued effect of the embellishments.